From left: SCSO Victim Advocate Coordinator Autumn Roppolo, GAL Child Advocate Manager/Team Leader Lynne Higgins, Sheriff Tom Knight, 12th Judicial Circuit GAL Director Toni Latortue, GAL Child Advocate Manager Keith Hammond, Community Affairs Director Kaitlyn Perez, and Colonel Kurt A. Hoffman. Sarasota County Sheriff Tom Knight was recognized Tuesday by the Florida Statewide Guardian ad Litem Office as the 2019 Community Advocate of the Year for the Twelfth Judicial Circuit. 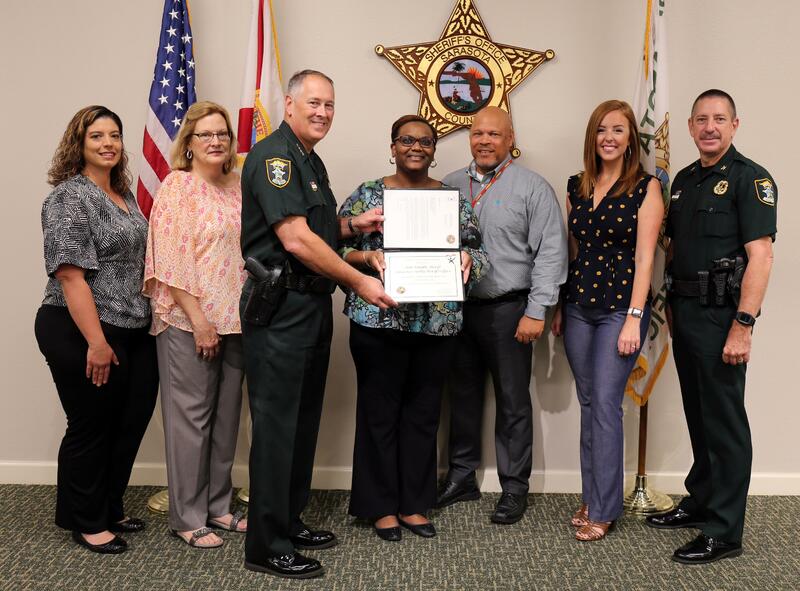 The sheriff’s office has a longstanding partnership with the Guardian ad Litem (GAL) program as personnel regularly work with GAL through the child welfare systems, from initial contact through the entirety of investigations including court proceedings. In 2017, the sheriff’s office launched its inaugural holiday toy drive benefiting GAL, which garnered more than 750 donations including more than $1,000 in gift cards for children ranging in age from newborn to 18 years old. In 2018, the agency would go on to double their donation from the previous year by collecting more than 1,300 gifts including more than $3,700 in gift cards. Donations were then delivered to GAL offices where volunteers sorted through toys and made selections for the more than 1,500 children from throughout Sarasota, Manatee and DeSoto counties removed from their homes due to abuse or neglect. To learn more about GAL, visit www.12gal.com.